Encompassing more than 7.3 miles of multi-use trail running by trees, flatland, soft hills and water, Southern Walnut Creek Trail consists of 10-foot wide concrete paths designed to accommodate a variety of users. This beautiful nature-filled trail extends from Govalle Park to the Walnut Creek Sports Park at Johnny Morris Road and Daffan Lane and includes 5 bridges, culverts, signs and benches offering a breath-taking view at every turn. The Southern Walnut Creek Trail is a portion of the planned Walnut Creek regional trail system that the Austin Parks and Recreation Department began working towards two decades ago. 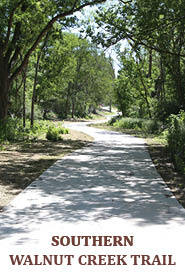 The trail provides connections to multiple neighborhoods including, Govalle Park, The YMCA at Hwyt 183, Davis White Park, Walnut Creek Greenbelt, The Austin Tennis Center at the Walnut Creek Sports Park and phase I of the Austin to Manor trail system. The future of Walnut Creek regional trail will be a major east Austin connection to other planned regional trail systems including the Colorado River and Onion Creek Trails and will connect in the future to the Northern Walnut Creek Trail that will begin at Balcones Park and connect to the Walnut Creek Metropolitan Park. The funding for the trail came from the U. S. Department of Transportation and was administered by the Texas Department of Transportation (TxDOT). TxDOT provided a grant in the amount of $8,080,000 and the Parks and Recreation Department provided a match in the amount of $2,000,000, which funded the design of the trail. 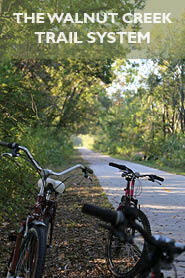 There were also some supplemental funding sources from the 2006 Bond program for Trails. Hours for trail are 5:00 a.m. to 10:00 p.m. Curfew for the Southern Walnut Creek Trail is from 10:00 p.m. to 5:00 a.m.
To report trail maintenance issues, please call 311. Hours for trail are 5:00 a.m. to 10:00 p.m. Curfew is from 10:00 p.m. to 5:00 a.m.